Buy Anhyra a Coffee. ko-fi.com/anhyracosplay - Ko-fi ❤️ Where creators get paid by fans, with a 'Buy Me a Coffee' button. Welcome to my Ko-Fi! :) I'm a spanish cosplayer and I love to create tutorials and share cosplay tricks with everyone. Buying me a coffee will help me to publish content more often and make new tutorials! 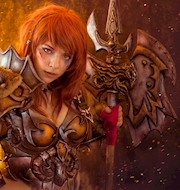 Each donation will be fully invested in cosplay materials ^_^ Thanks for your support! Secured Payments. Support goes to Anhyra's account. Eva Foam to make my orc rogue! Upgrade Anhyra to a yearly Gold Membership with a one-time payment.